and they ended each bit with a grin. This is the moment you've been waiting for, though you probably had no idea you were waiting for it until I just told you. The Escapist, home of Zero Punctuation and Jimquisition, has brought the stars of both series together at last, in what can only be described as a long-overdue ode to videogames. If you're familiar with these two personalities, then you know not to expect doting sonnets brimming with love and adoration. While they are sure to express what they love on occasion, I expect you're looking to their lyrical genius more for what riles them up than what calms them down. 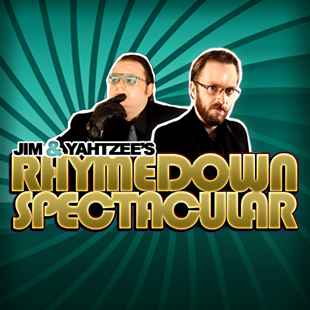 Jim & Yahtzee's Rhymedown Spectacular will give you a weekly dose of videogame-related poetry every Wednesday, right here on The Escapist. Whether you're a fan of Jim Sterling's scathing criticism of anything and everything in the games industry, or you're proud of your unabashed fondness for Yahtzee's bile-and-snark-filled treatment of the latest titles, Rhymedown Spectacular has your wants and desires well in hand. All of this will be done in fittingly poetic style, of course, with both Jim and Yahtzee presenting their latest lyrical labor of love. If you aren't convinced it can get any better than Yahtzee's Wolfenstein review in limerick, don't take my word for it. Check it out below, and be sure to come back every Wednesday for more prose from the pros.